With my fingers and wrist becoming more usable, I'm testing my abilities to cook and bake again. The one downfall still is that I don't have the steadiness in my left hand to make the final presentation picture perfect. But the food is still outstanding! 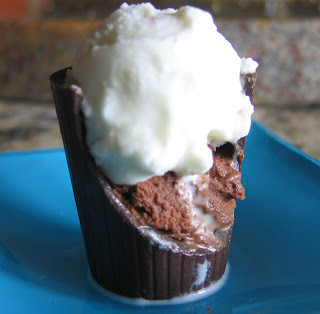 These little dessert cups are downright amazing. My goal was to make a creamy chocolate ganache-like filling, and pair that with a minty gelato....I was choosing a gelato here because I didn't want a real creamy ice cream. I was going for more of a sherbert quality, so that it would consist of little tiny ice crystals; hoping the minty crystal would pair well with the creamy ganache. Success! This worked out exactly as I strived for. 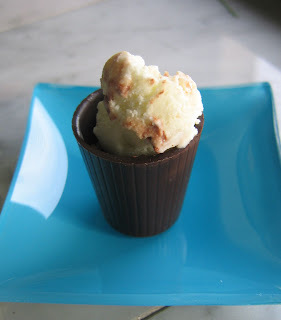 And it's a super fun mini dessert in these little chocolate cups; but feel free to serve in just a bowl. You can also use chocolate ganache as a sauce, either use while still warm before putting in the fridge to cool, or warm later to a runny consistency and pour over the mint gelato (or whatever) like a sauce. I prefer it the original way as I think more of the baileys and kalua flavor come through- but try it both ways and go with your preference. You may find yourself with a spoon in hand just eating directly out of the bowls....just remember to get a new spoon- nobody likes a double dipper!! Stir until chocolate is al melted. Place in the refigerator for about half an hour to chill. 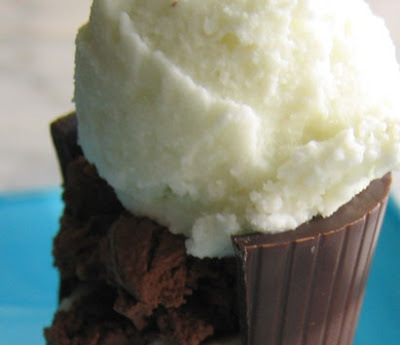 Fill chocolate cups with a scoop of the ganache and top with a scoop of the mint gelato. Okay, these look positivly delish!! I will try them! AZmom- do try them, they are delish! Do keep in mind the mint gelato is meant to be with the chocolate not alone...also pairs well with warm brownies and cookies too.